Julianne Moore’s still got it! A stand out performance from a talented actress. 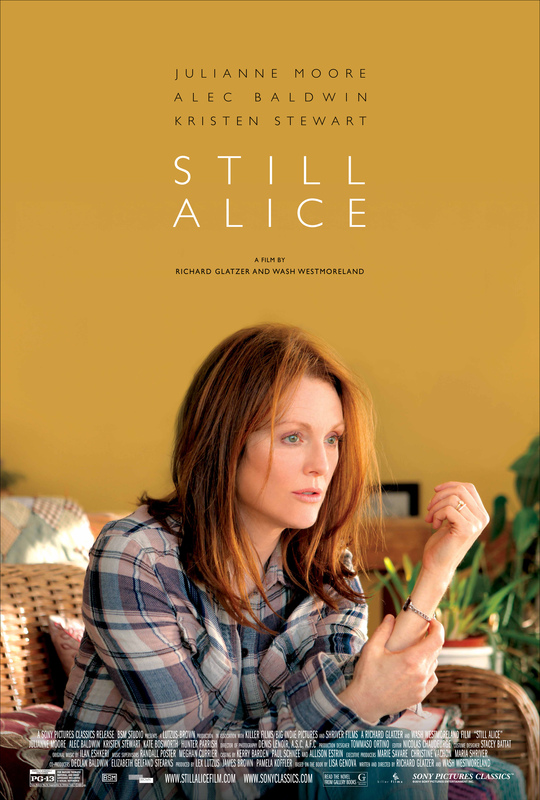 A linguistics professor (Julianne Moore) and her family find their bonds tested when she is diagnosed with Alzheimer’s Disease. I knew it would have to take something special to stop Pike or Jones taking the gold. A heartrending, emotional drama on a disease that really needs looking at. I know Moore’s Oscar win caused a little stir back in the UK. That was mainly because it hadn’t been released at the time! BUT here we are at last . . . and it’s good. Directors Richard Glatzer and Wash Westmoreland allow for a slow burning piece as we join Alice celebrating her 50th birthday. It wasn’t long before you noticed her making little mistakes; answering the wrong question, forgetting words, etc. At first glance, minor quibbles. Who hasn’t been guilty of mixing up the odd word or forgetting their train of thought? Innocently playing it down to age, Alice continues her work and enjoying time with her family. There was a tense atmosphere around the film as the impending diagnosis lingered around the corner. Alice soon forgets where she is, people’s names, notes on her presentations. And the initial diagnosis came short and sharp. Moore was perfect for the role and you really felt for Alice as she did everything she could to fight this challenging disease. The range of emotions that she encapsulated were brilliant. Going from defiant to angry, confused to sad in a matter of a few frames. I couldn’t possibly imagine what that would feel like. Alice was diagnosed with an incredibly rare stand of Alzheimers (I wasn’t even aware that were a variety of types). Her mental condition soon deteriorates much faster than she was prepared for. Or even ready to accept. The original questions that Alice had to answer to test for Alzheimers threw me off. Something as simple as being told to remember a name and an address and being asked later about the details after a conversation was crazy. The memory tests that Alice gave herself were quite interesting to watch. Writing three words on a chalkboard. Putting a timer on. And going back to write said words felt like a little game. I was trying to remember them as the family drama unfolded. There was a talented cast involved in the family dynamic; Alec Baldwin, Kate Bosworth and Kristen Stewart. Their reactions to Alice’s diagnosis and inevitable deterioration were unexpected. The discovery that the condition can be passed on to your offspring was a daunting prospect. The probability of one of Alice’s children carrying the gene being incredibly high. Kristen Stewart, where has she been? Still donning the tom boy look and mumbling away. Her performance perfectly suited the role of Alice’s younger daughter. She worked well with Moore and you really felt for their relationship. Despite all that’s going on for Alice, she was still concerned for her daughter’s carefree attitude and refusal to accept her failing acting career. Mothers never stop caring. No matter what. Kate Bosworth was good as her snobby older daughter. An early revelation certainly spiked the tension BUT as the film progressed, her character seemed to disappear into the background. Alec Baldwin didn’t seem to be in this as much as I thought. Obviously, the film was always going to be revolved around Alice BUT his constant disappearing act was a little irritating. Thankfully, there was a reason for this, which led to sombre viewing. Despite a stellar performance on a serious condition and for all the hype, the film left me wanting. I don’t think it helped that the ending was quite odd. I could see what the writers were trying to do BUT it came off a little abrupt and long at the tooth with Kristen Stewart mumbling away about looking down from the sky to her bemused mother. It just seemed a little pretentious and fizzled out what had been an engaging story of one woman’s struggle. It was still heartbreaking, dramatic and tough to watch. A scene involving a video message from a recently diagnosed Alice to an ailing ageing Alice certainly hit home. Alzheimer’s Disease still needs to be looked into and I’m glad that films like these are getting made. The only other film that I could recall was the underrated Away From Her with Julie Christie. This could happen to anyone. Worth a watch. As a little side note for any Walking Dead fans; Seth Gilliam played yet another pointless role. Yes! Even more useless than Father Gabriel Stokes. I know. I didn’t think it was possible.